Click and control-click (for PC users) or click and command-click (for Mac users) on the kits to show their details in the Kit View in the right side bar. When you click on a node in the Segment View, the Kit View will list a group of matching kits. Click on the kit number to expand any kit. You can expand all the kits in the Kit View. 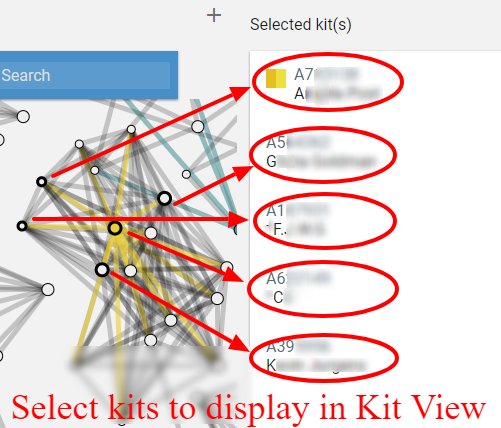 How do I open clusters in Kit View from the Triangulation View? Hold down the shift key (not the command or control key) while dragging the mouse over the selected cluster. A gray box will mark the area. When you let up on the mouse, all kits in the area you dragged over will appear in the Kit View.